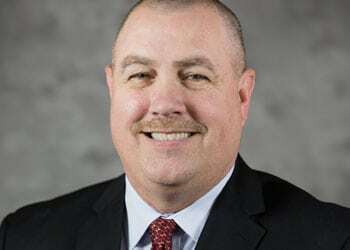 (April 30, 2015) — The Meriwether Lewis Electric Cooperative Board of Directors named Keith Carnahan as the cooperative’s new Chief Executive Officer on April 28. Carnahan will step into the new role when Hal Womble retires in July after 16 years of leading the cooperative. Carnahan is a graduate of Tennessee Technological University with a Bachelor of Science in Electrical Engineering and received his MBA from Bethel University. He has been an employee of E.I. DuPont for the past 27 years serving in several engineering and management positions and was most recently the Site Engineering Manager for the New Johnsonville Plant. During his tenure at DuPont, he led numerous improvement programs that helped the New Johnsonville Plant become a world class producer of Titanium Dioxide. Also, for the last 5 years he has served on the Board of Directors for MLEC representing Humphreys County. Carnahan and Lisa, his wife of 28 years, make their home in Waverly, Tennessee. They have three daughters – Alyssa, Ashton and Allie. His hobbies include duck hunting, golf, and cycling. Meriwether Lewis Electric Cooperative, a Touchstone Energy® cooperative, is a non-profit organization offering reliable, low-cost electricity to over 33,500 members in Hickman, Houston, Humphreys, Lewis and Perry counties. Member – electric power companies of Middle Tennessee. Remember to play it safe around electricity.